“I’ll be your mom until your mom comes,” are the words Tameeka Walden, a member of the KIPP Life Academy Parent Partner Association (LAPPA) at KIPP New Jersey, uses to describe her commitment to the children and families at her school. For Walden, whose daughter attends the school, a whole new level of parenting begins when students set foot on the school grounds; the campus becomes a community—a village—that looks after the children and each other. “I know that not every parent can be as involved as I am, but it’s important for parents to get involved so that we can all support each other and create change. I made a promise that as long as my child is in this building, all of the children are my children too. Why not have a village looking out for your child?” Thanks to KIPP New Jersey’s Parent Partnership Teams, parents like Walden are discovering that when united, the parent voice can be a powerful tool to get things done. Every KIPP school in Newark has a Parent Partnership Team that fosters community and works to ensure that students succeed. Parents have rallied to petition the city to provide more crossing guards at intersections to keep all kids safe. They also help fundraise for programs, work collaboratively with school officials to purchase needed school supplies, provide student enrichment opportunities such as special performances and field trips, and offer support to teachers. Their reach extends beyond the classroom, too. Hundreds turn out for community events like the Making Strides Against Breast Cancer walk in Newark and other initiatives. 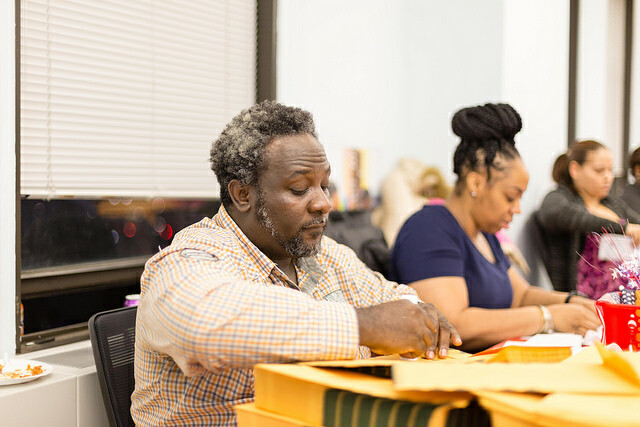 Parents volunteered at an envelope stuffing event as part of their “Get Out the Vote” initiatives this past year. But college isn’t the only positive outcome of parent engagement. Last year, parent leaders led Get-Out-The-Vote efforts to register new voters and encourage parents to exercise their right to vote. As a result, the group registered hundreds of parents and raised the number of KIPP voters in Newark from 40% to 61%. With important state and local elections around the corner, KIPP parents are mobilizing and making their voices heard. This story first appeared in the first edition of the KIPP New Jersey Magazine, a magazine for the KIPP New Jersey family. This is a guest post on the KIPP New Jersey Blog. More information about the author can be found in the title line or in the brief bio at the end of their guest post. KIPP New Jersey 2002 - 2019 | Website Development by Atarah Software, Inc.